Gott Heart Art: BD Party Favor! First, you enjoy some Push-Up Pops with the kids or grandkids. Second, and this is important, don't let anyone throw the cardboard tubes away when you're finished. 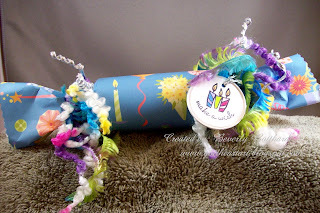 Third, you have an instant party favor for any kind of party, mine happens to be Happy Birthday! These tubes are not as large as toilet paper rolls so you would probably have enough papers in your scrap box to do a few, don't forget they don't all have to match(even though I tend to be the matching girl). 2 of these challenges have been up and running for a while now, but, you might want to hop over to Stampin Royalty and give them a check out, this is their very first challenge! I love to try new things, don't you? Stamptacular Sunday Challenge Challenge #40: Party Time! Supplies: Push-Pop tube, Paper: American Traditional-Celebrate Scrap Pad, Stamp: Fiskars-how many candles, Ink: Ranger Archival Ink-Jet Black, CTMH markers-lilac mist, citrus leaf, sunkiss yellow, watermelon, sorbet, baby pink, dutch blue, Sakura Gelly Roll pen-Clear Star, silver wired ribbon, fibers from $ store, Paper Crafting tags value pack, decorative scissors. What an amazing idea!! I will defiantly have to give this a try. Thanks so much for playing with us at Stampin' Royalty! I'm so glad you decided to play along with us at Stampin' Royalty. And you made our first 3D entry. Very cool. I love the idea of this cracker! great job! Thanks for playing with us at Stampin' Royalty! So cute! Love the fibers and happy birthday colors! I never would have thought of pop ups...great idea and it turned out sooo cute! I'm so glad you joined us this week at the Stamptacular Sunday Challenge! A gorgeous cracker and a fabulous idea. Thanks for joining us at SSC. What a fantastic party favor. I love your little tag. Great idea. Thanks for joining in at SSC.